BUFFY! aka The Vampire Slayer. *sniff* This scene always has me in tears. I’m stumped. I didn’t watch a lot of TV as a kid. Maybe Sesame Street or Reading Rainbow? The first show I remember watching regularly was Beverly Hills Teens when I would get home from school. That was when I was about 7 or 8, I think. Around the same time, we got cable in our house and my go-to show became The All New Mickey Mouse Club. The first few seasons with the members of The Party not the later seasons with Britney, Christina Aguilera and Justin Timberlake. I loved the TGIF sitcom block on ABC too. Full House, Family Matters, Just the Ten of Us, etc. It’s interesting that I watched more sitcoms growing up than I do now. Huh. I started the 30 Days of TV Meme right around the time that we moved last summer and I inevitably got caught up with unpacking that I didn’t even get halfway. Let’s see if I can pick up where I left off and actually finish it this time. 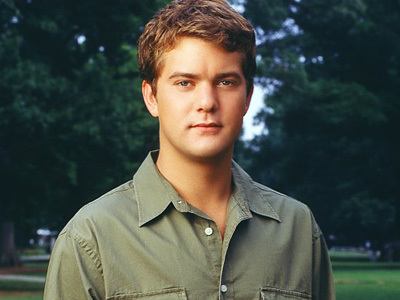 I could take the easy way out and name a Dawson’s Creek episode since there are many that I’ve seen at least 5 times. But I thought I’d go with the series finale of another one of my beloved shows, The OC. The End’s Not Near, It’s Here isn’t a perfect episode but it’s hopeful. Which is exactly what I wanted for these characters I loved so much. 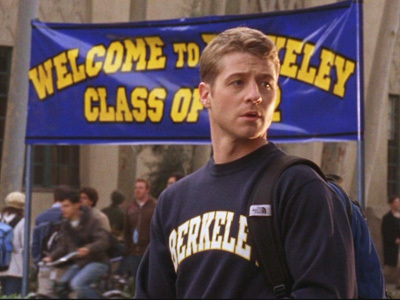 The episode featured a mix of closure (Cohens moving to Berkeley, Julie choosing herself, Ryan and Seth heading to college, and Summer joining GEORGE) with flashes to the future (Julie graduating from college, Seth and Summer getting married, Ryan becoming an architect) and hints of what might be next for the characters (Ryan and Taylor!!!). 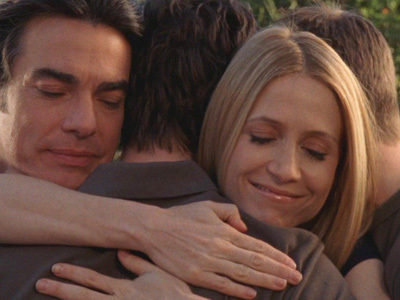 When I feel nostalgic for the show, this is the episode I tend to watch — it’s such a satisfying goodbye. Thanks for the well wishes! 🙂 Rob, Diesel & I are super happy about the house. We’re painting this weekend and the movers are coming 4th of July weekend. Exciting! Ok, back to my regularly scheduled meme. It’s not your typical crime drama. 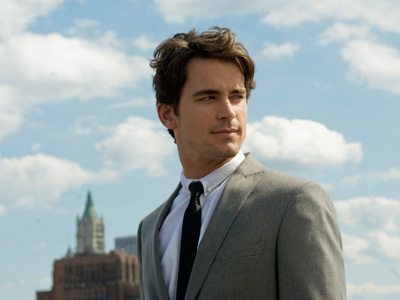 Especially when you have the delectable Matt Bomer playing white collar criminal turned FBI consultant Neal Caffrey. HEISSOCUTE. And I *adore* his unlikely love/hate relationship with his FBI handler Peter Burke. Their back and forth banter makes me positively giddy. Honorable mention goes to The Vampire Diaries. Honestly, I had EXTREMELY low expectations for this show (I’m not a Twilight fan). I pretty much only tuned in because the CW owns me. But I was pleasantly surprised. The story actually progresses in every single episode! That’s pretty much unheard of in a teen show. And there’s a love triangle that’s well done. I can’t even decide between Elena/Stefan and Elena/Damon. Craziness. It doesn’t hurt that the cast is HOT. Guh. CHUCK! It’s a hidden gem. I SWEAR. I know that a computer whiz downloading government secrets into his brain (and later becoming a super spy) sounds a little (ok, a LOT) out there. I get it. That’s what I thought too! But it’s about the characters. Chuck’s a likable boy next door who works at the Buy More (aka Best Buy) and has a “secret” life complete with NSA & CIA handlers John Casey and Sarah Walker. And OMG, their interactions and spy missions are awesome. Throughout the past 3 seasons, we’ve watched them accept each other and develop into a real team capable of learning from and appreciating one another. Throw in Chuck’s nerdy best friend Morgan and his over-protective sister Ellie (neither of whom know his secret) and you’ve got yourself a fun action-comedy. LOVE THIS SHOW. Catch up on DVD! We’re supposed to close escrow on our house this week so my brain is too focused on packing and moving to write real blog entries. So instead, I will attempt another 30 Day Meme! Heh. This one’s about TV so hopefully I’ll actually finish it this time. I’ll agree with EVERYONE and say Firefly. I found the show on DVD well after it was canceled and with only 14 episodes, it left me wanting more. 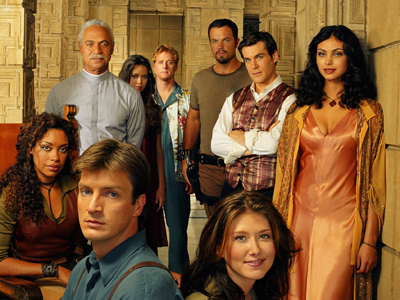 I loved Mal and his ragtag band of Serenity crew members. Freaking FOX always ruins everything. I’d also like to give an Honorable Mention to Everwood. The show did have 4 wonderful seasons, though, so I’m just being greedy.